There are three varieties of Theobroma cacao, as it was officially named in 1753 by the Swedish scientist Carl von Linné. They are criollo, forastero and trinitario, and multiple hybrids exist of each strain. Criollo and forastero came first, but although they both evolved in the Amazon Basin, they are quite distinct from one another. Forastero beans give a classic chocolate taste, but tend to lack the subtle flavour notes of the less robust, less productive criollo, which produces a much more interesting range of flavours and aromas. 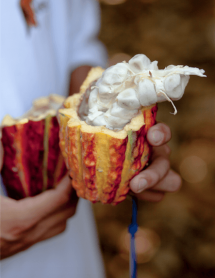 Forastero is typically the hardier, more reliable strain and has a higher yield of cacao pods. As a result, it’s easier and cheaper to grow, which is why it accounts for more than three-quarters of the world’s cacao crop. Forastero is generally used to make mass-produced chocolate. It’s consistent and reliable, but can be rather bland. Just as in Maya and Aztec times, when lower-grade cacao was mixed with maize and other seeds, while high-quality chocolate was drunk in a purer form, present-day manufacturers use cheaper, less interesting cacao to make average confectionery and save the fine, rare beans for making rich, flavoursome dark chocolate. 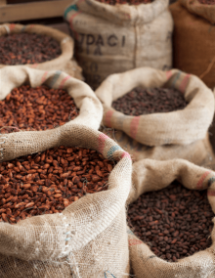 Since cacao is so variable, as well as so valuable, the chocolate industry has always attracted counterfeiters and swindlers. Aztec market traders, when selling cacao beans, often used to make their wares go further by mixing them up with avocado stones, bits of dough, wax, clay and anything else that could pass for the real thing. In Europe in the eighteenth and nineteenth centuries, chocolate was frequently diluted with brick dust or red lead, and lard was added to cacao butter to bulk it out. These days, the mainstream confectionery companies print their ingredients on the labels so that everyone can see how much fat, sugar and lecithin goes into your average bar, yet amazingly people still call it chocolate! The trinitario bean has an interesting history. When virtually the entire crop of Trinidad’s criollo cacao was wiped out in the eighteenth century – either by a hurricane or by a plant disease of some kind – forastero trees were introduced to the island, where they cross-pollinated with the few remaining criollo trees to produce a new strain of cacao. Trinitario is hardier than criollo, but tastier than forastero, so it’s very versatile. Some of my favourite chocolates are made from trinitario beans.